The founder of female friendly dating app Bumble, Whitney Wolfe Herd, 29, is determined to run her own race, regardless of bad weather or critics. The American from Utah who co-founded dating rival Tinder before an acrimonious falling out and ongoing legal action was at Flemington on Tuesday as a sponsor for the Melbourne Cup. Despite those headlines, Wolfe Herd knows that romance is big business. 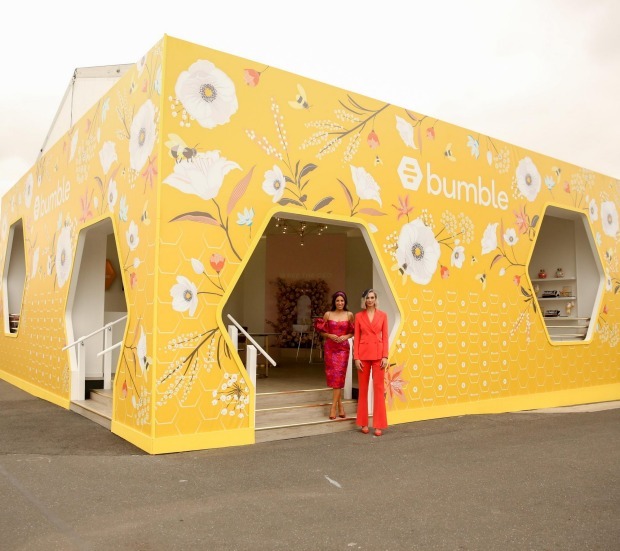 Bumble is now valued at between $US1.1 and $US1.5 billion ($2 billion) by analysts and her own wealth is estimated around $US230 million. Majority holder of Bumble’s parent company, Russian billionaire Andrey Andreev, is reportedly talking to banks including JPMorgan Chase about a possible Nasdaq listing. “We are looking at pursuing it [an IPO], nothing is definitive, nothing is set in stone and we are looking at a range of paths as any business at this stage would do,” Ms Wolfe Herd told The Australian Financial Review. Rival Match, which operates a portfolio of online dating companies such as OkCupid, Match.com and Tinder, listed in 2015 for around $US2.9 billion but Wolfe Herd says she wishes them all the best, despite suing Tinder after claiming she was sexually harassed by her co-founder and ex-boyfriend Justin Mateen. Ms Wolfe Herd reportedly settled for $US1 million, which she used to help launch Bumble with the founder of dating app Badoo, Mr Andreev. Bumble is also being sued by Match over alleged patent infringement in a case which continues. “There are ongoing legal proceedings, that is why their lawyers and our lawyers. I wish them nothing but the best and am focused on our growth,” she said. “It annoys me when people are always looking at competitors. Stay focused, leave your competition on the track. Bumble claims to have reached 1.7 million registrations in Australia despite officially launching here only last December. Unlike its competitors, Bumble requires women to initiate the conversation once they’ve matched with a prospective partner. The largely white-collar user base has enthusiastically adopted the subscription model of $US9.99 ($13) a month and is using the Melbourne Cup Carnival to promote its Bumble Bizz feature, which launched earlier this year, aimed at putting an end to harassment on recruitment platforms for women. Given the optimistic outlook, it is not surprising the diminutive Ms Wolfe Herd – dressed in canary yellow from Yeojin Bae and headpiece by Mimco – is not deterred by the bad weather and only sees clear skies ahead. “The weather did this on my wedding day. It’s a nice Irish blessing. Genuinely, I don’t think anything could kill the spirit,” she said. “At the end of the day we are all looking for the same thing – respect, love and opportunity. I hope the #MeToo movement pushes things in a kinder direction.